Soft feel, showerproof, protective, peva material. Useful internal secret zipped pocket for safe keeping of mobiles, make-up, jewellery, lingerie etc. Ideal for wedding dresses, bridesmaid dresses, prom dresses, ball gowns etc. Quality full length zip, shaped shoulders and top hole for hanger hook. Lower loop allowing easy carrying when draped in half. Bell-shaped with 8'' tapered gusset to avoid crushing trains, petticoats etc. 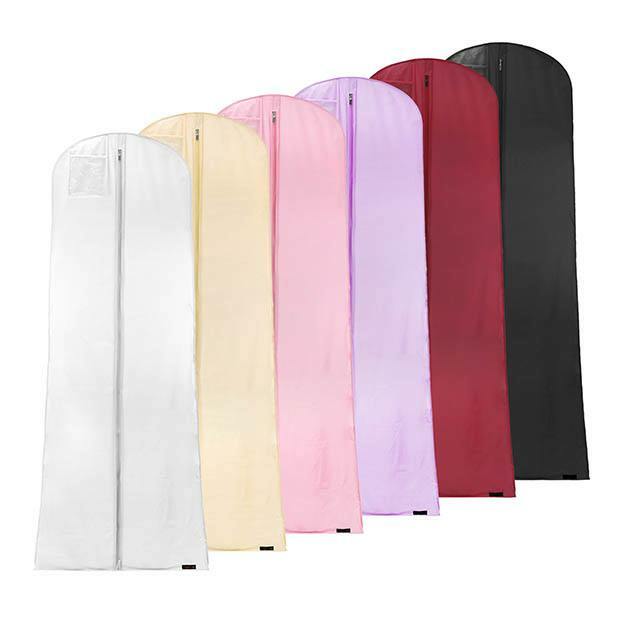 All Hangerworld branded covers are guaranteed to be acid free (ph neutral) and colour run resistant. Size: Length x Width 72'' x 26'' (183cm x 66cm) approx.